Protein expression is almost universally used by research groups for a variety of purposes. There are three main expression systems available today giving researchers enough choice to find the best system for their specific application. Those systems are Bacteria, Baculovirus/insect, and Mammalian cells. The features of a target protein inform which expression system is best suited for expression of that protein, and it is important to identify the correct system for protein expression based on these criteria. These specific features include sequence and structure as well as activity, function, folding, and post-translational modifications (PTMs). PTMs to the amino acids comprising a protein may be essential to the final application of a protein and encompass attaching biochemical functional groups such as acetate, phosphate, various lipids and carbohydrates which may alter the chemical or physical nature of the proteins. While each expression system has varying abilities to impact these criteria, it is important to consider that expression of some proteins may be tolerated well in one system and be toxic to another. GenScript's Protein Expression Evaluation Service can take away the guess-work by conducting an inexpensive expression test in bacterial, insect, or mammalian expression systems and delivering an expression report. E.coli is one of the most commonly used protein expression systems and protein expression is usually induced using a DNA plasmid expression vector. This bacterium can be grown easily and inexpensively under standard laboratory conditions and expression using this system is relatively simple, fast, and inexpensive. If a target protein originates from a prokaryotic system, E.coli is an easy choice. If, however, the protein is of eukaryotic origin, the PTMs cannot be guaranteed in this system and another system may be preferable. In the case that PTMs are not important in the target protein, E.coli can still be a good choice for even eukaryotic protein expression. Baculovirus/Insect expression system allows for expression of high quality glycosylated proteins that cannot be expressed using E.coli or yeast. Insect cells are a higher eukaryotic system than yeast and are therefore better able to carry out more complex PTMs. They also have superior machinery for folding mammalian proteins and therefore give the best chance of obtaining soluble protein when a protein of mammalian origin is expressed. Mammalian cells are more complex than bacterial cells and have the most sophisticated protein production capabilities including mechanisms to assist protein folding into the proper conformation like chaperones and modifications (glycosylation, methylation, phosphorylation etc.). For a protein with mammalian origin, the activity can be related not only to the primary structure (sequence), but also to the conformation and modifications, while other systems, especially when distantly related, cannot accomplish all the modifications found naturally in mammalian cells. This is a reason why many researchers believe the activity of mammalian proteins is best when expressed in a mammalian cell. GenScript employs genetically modified CHO and HEK293 cells together with elaborately designed expression vectors to give high yield and quality protein production, which has been proven by hundreds of successful projects. ** Yeast is the least expensive and quickest eukaryotic protein expression system. At GenScript, YeastHIGH™ technology is used for high-yield, high-productivity protein production, reducing the associated costs and time requirements. In order to ensure the success of your project, each submitted project will be evaluated for by our project managers. Due to the technical specifications of service, we may not be able to accept all projects. Then GenScript can generate the precise tools you need through Gene synthesis and custom subcloning. Gene synthesis circumvents the hassles and uncertainty that arise from performing series of digests, ligations, and mutagenesis, selection, sequence verification, etc in your own lab. More importantly, de novo synthesis gives you complete flexibility and control over your DNA sequences, so you can take advantage of OptimumGene™ codon optimization to improve heterologous protein expression by introducing synonymous mutations to optimize mRNA stability and efficient translation while preserving the amino acid sequence. If you intend to deliver your DNA construct to cultured cells or model organisms in your lab through transfection, transformation, electroporation, viral vectors, etc, then GenScript can help you select the best vector from among its comprehensive libraries of plasmids, BACs, lentiviral vectors, etc, or we can clone your construct into any commercially available or customized vector you send us. We can help you maximize gene delivery efficiency, select for transfectants, and monitor protein expression with fluorescent tags. Once we've synthesized a protein-coding construct, we can predict how robust your protein expression will be through our PROTential Protein Expression Evaluation Service. If you need recombinant purified protein, we offer packages for protein expression and purification utilizing your choice of expression system – Bacterial, Insect or Mammalian -- and guarantee the amount and purity of your custom protein. 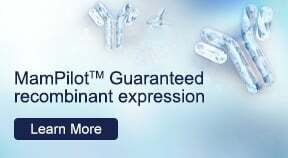 Our protein scientists use the same cutting-edge codon optimization and gene synthesis services that we offer direct to customers to produce our extremely high success rates and efficient turn-around for in-house protein expression – 99% of custom protein expression projects in bacaterial cells are successful and delivered on-time. 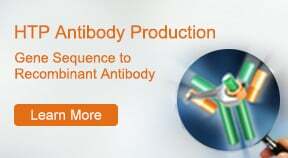 Finally, if you need custom antibodies to detect your protein of interest, GenScript offers a comprehensive suite of Custom, Guaranteed, and Phosphor-specific antibody packages. 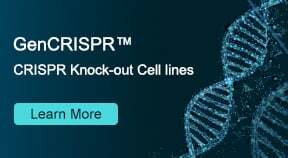 The most popular are our PolyExpress™ custom polyclonal antibodies which have a success rate of 95% in recognizing native protein using western blot and our MonoExpress™ custom monoclonal antibody packages, which include a western-guaranteed package.